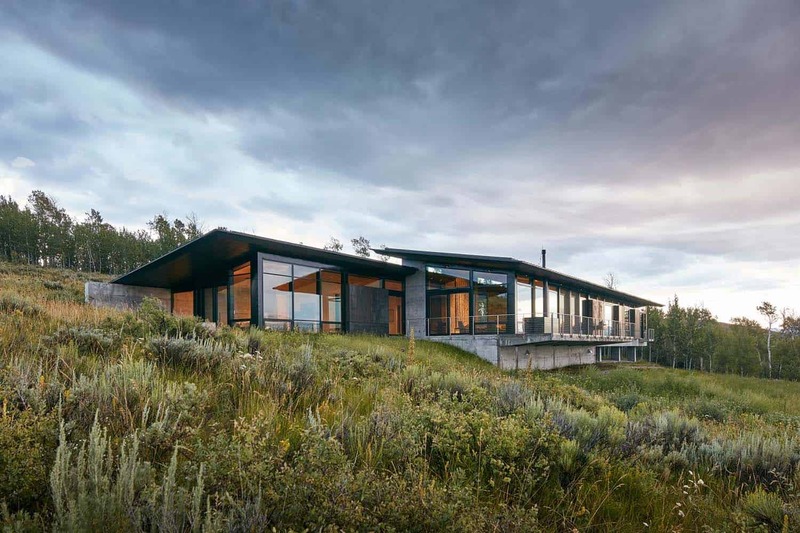 Abramson Teiger Architects have designed this striking modern mountain retreat that melds into its surroundings of the Teton Mountain Range in Wyoming. The clients of this home requested to have a design that is low-maintenace, spread out over one level that maximizes its mountainous views. They also wanted the home to seamlessly blend into its environment, exuding a casual yet sophisticated aesthetic. The structure has been elevated on a concrete slab supported by columns that appears to hover over its sloping site. 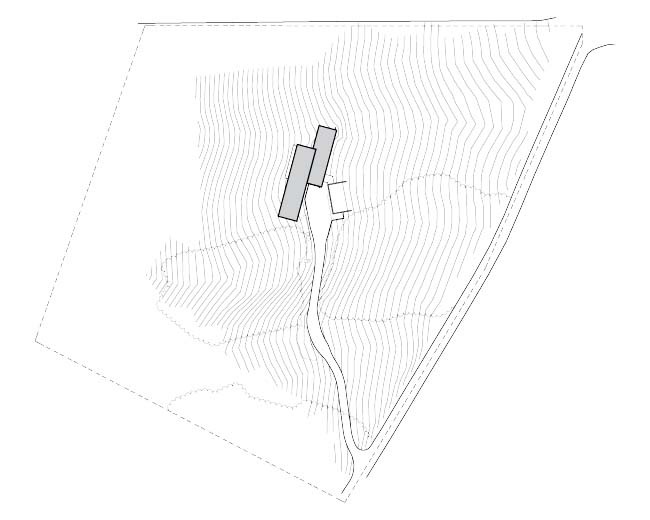 This clever design has helped to minimize the impact to the site, where the only part that is integrated into the naturally sloping site is the garage. The garage features a green roof, helping to camouflage it into its surroundings. 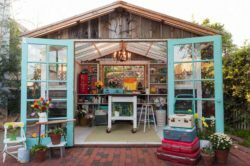 To meet the homeowner’s request to create a low-maintenace dwelling, the exterior facade is comprised of materials that will appear better over time. 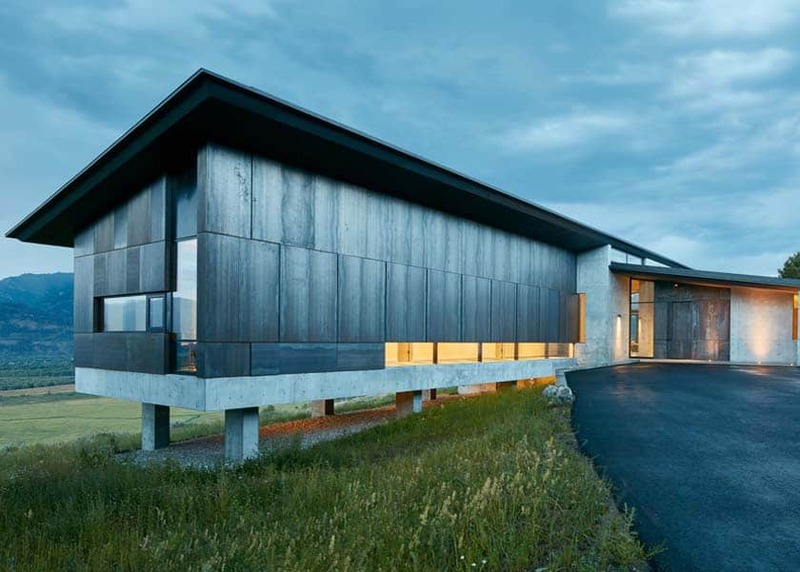 This includes Cor-Ten steel panels clad to a rain screen wall and a zinc roof. From the driveway, the front facade offers a stately appearance with clean lines and a striking aesthetic. 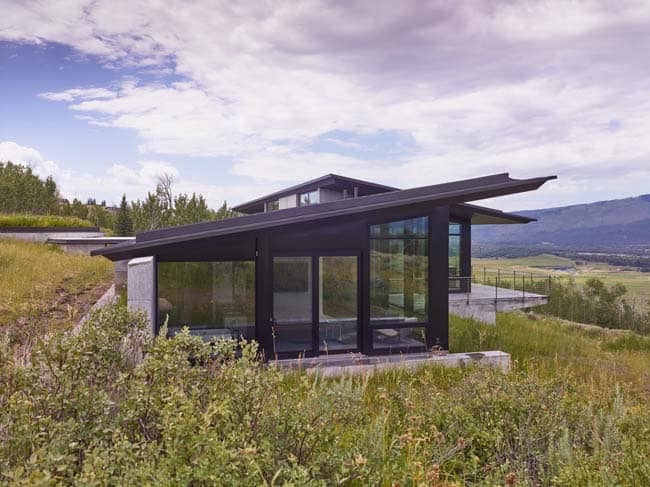 The cantilevered structure wraps around from the point of entrance to reveal a more modest side that appears to meld into its rugged environment. 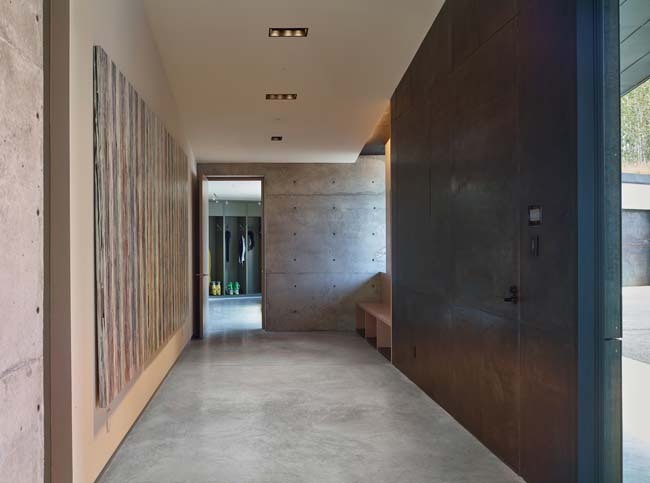 The interiors are characterized by sleek material elements of poured-in place concrete walls and polished concrete floors with radiant heat. 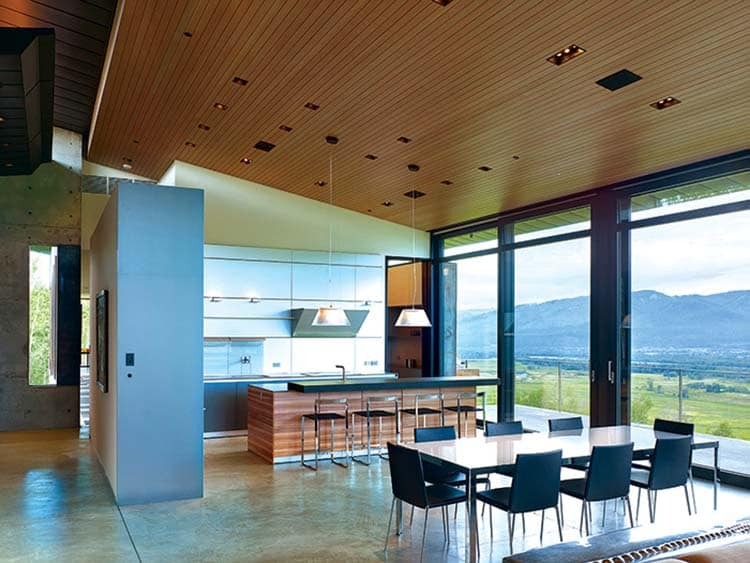 To infuse softness into this hard, industrial aesthetic, the architects integrated tongue-and-groove Douglas fir to the ceilings; accents walls were washed and stained in a warm gray shade. 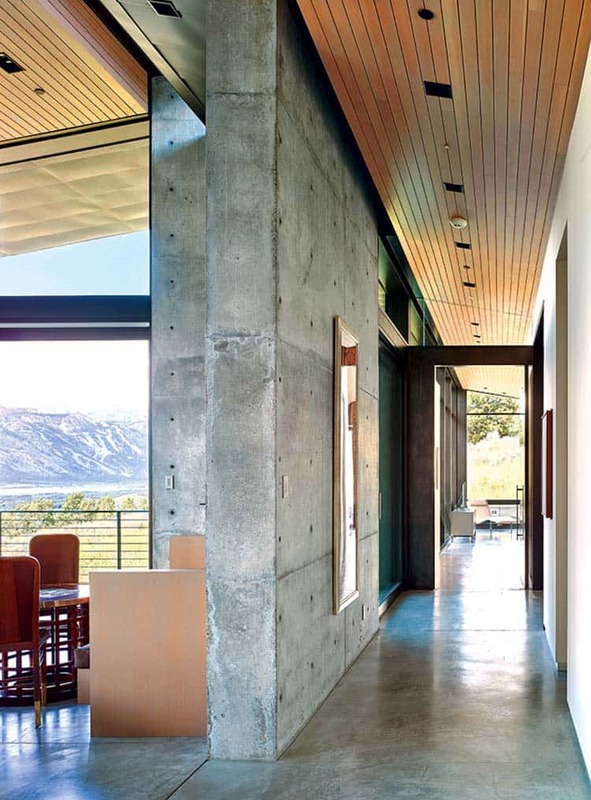 What We Love: This mountain retreat reflects a harmonious merger of function and design throughout. 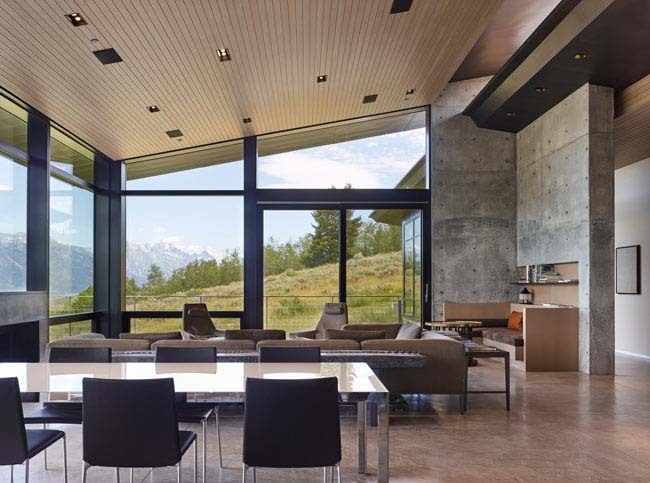 We love the home’s connection to its landscape and the incredible views of the Teton Mountain Range through expansive windows. 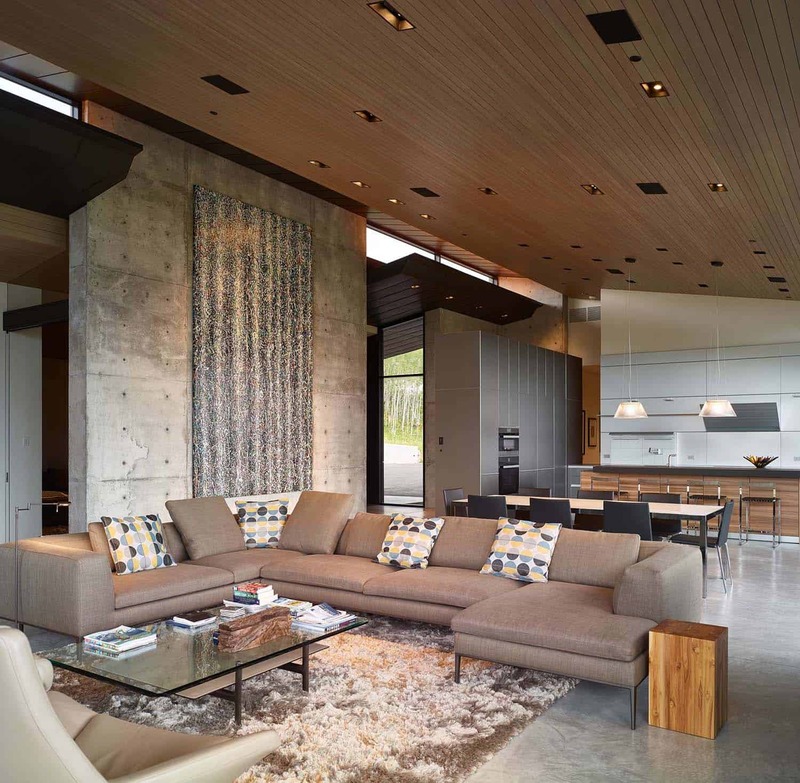 The sleek concrete floors and walls mixed with added warmth from textural furnishings and wood ceilings. 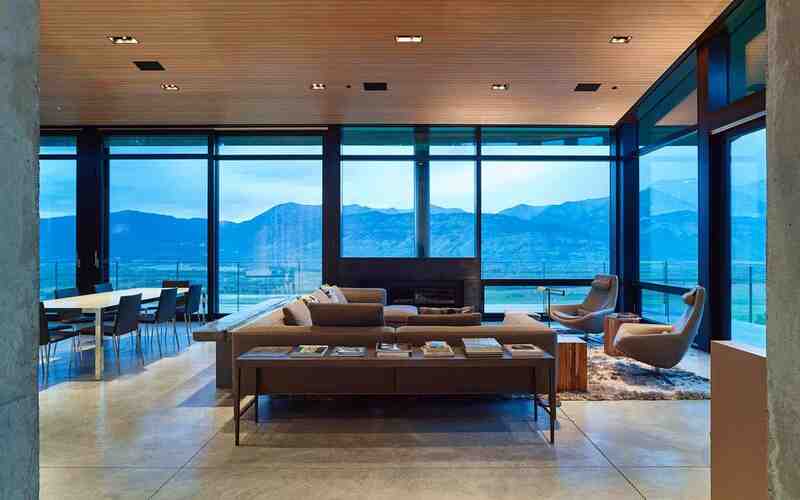 The conservative design aesthetic really helps to not detract from what takes center stage in this home, the breathtaking mountain vistas. 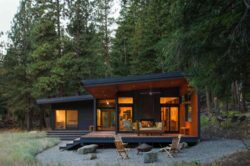 Readers, what are your thoughts on this mountain dwelling, could you live here? 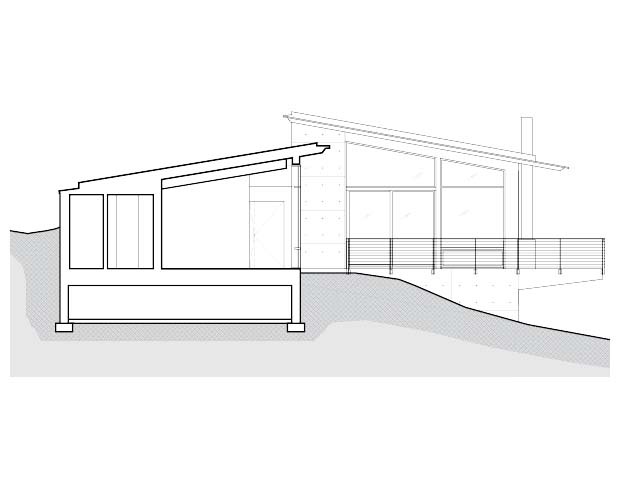 Above: Sliding glass doors opens out onto a spacious deck, helping to merge the boundaries between indoors and out. 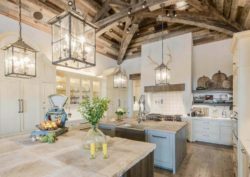 Above: A minimally designed kitchen features custom designed applewood cabinetry and a manmade quartz slab countertop. 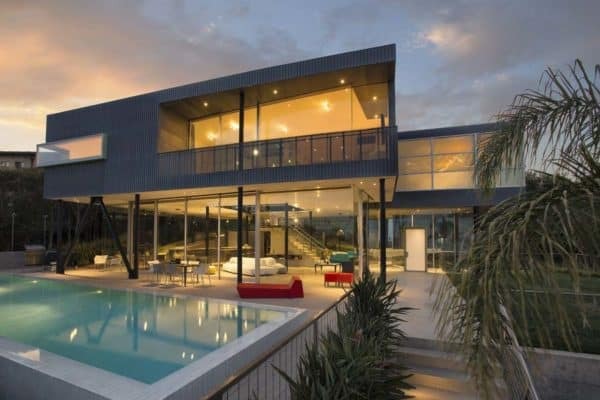 Above: The interiors are flooded with natural light through floor-to-ceiling windows that captures magnificent views of the surrounding scenery. 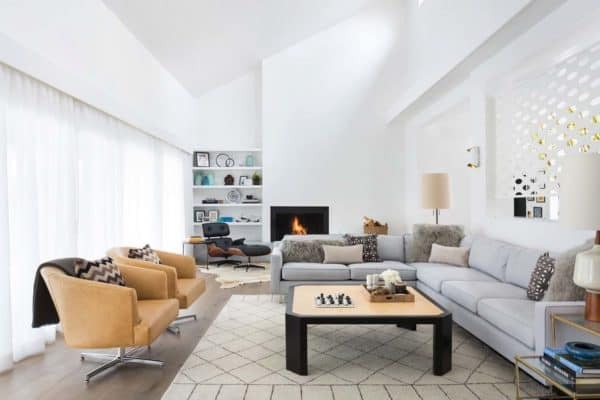 The main living area is voluminous yet still remains intimate thanks to cozy furniture arrangements. A built-in seating nook perfectly frames the views of the rugged landscape, left unobstructed thanks to a low-profile, blackened-steel fireplace. 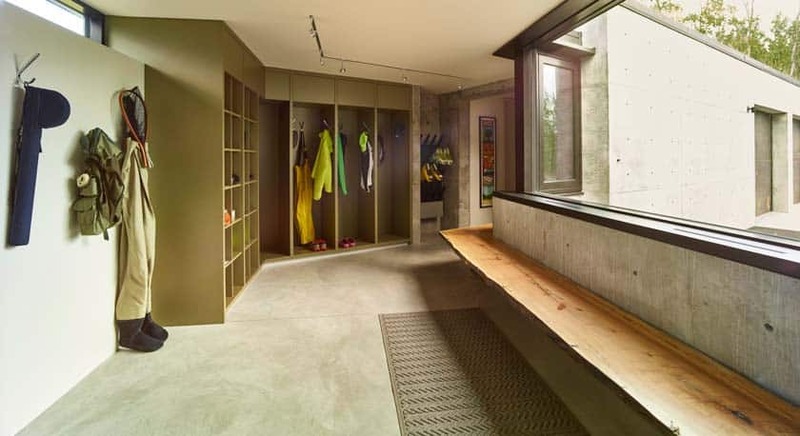 Above: Since the homeowners love to ski, this practical mudroom was designed with functional details, such as a built-in ski boot warmer and lots of built-in storage. 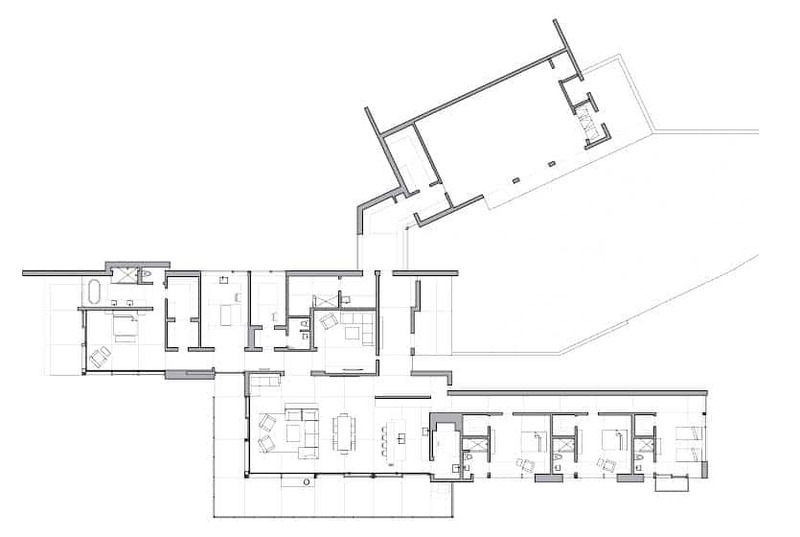 Above: The homeowners’ art collection was carefully considered when the architects were planning the design of this home. Drywall was used exclusively as a backdrop to hanging artwork. 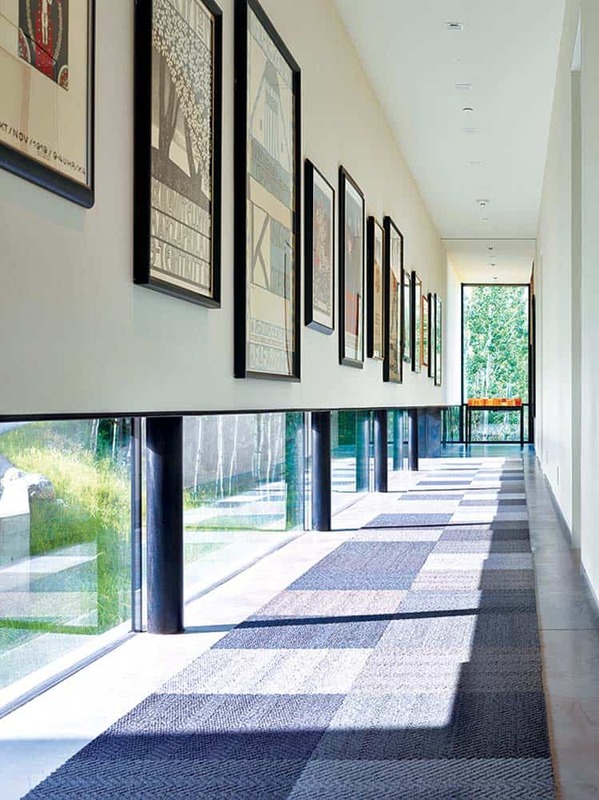 An art gallery was designed with low-hung windows to enable light to filter through while at the same time protecting the art from direct light. 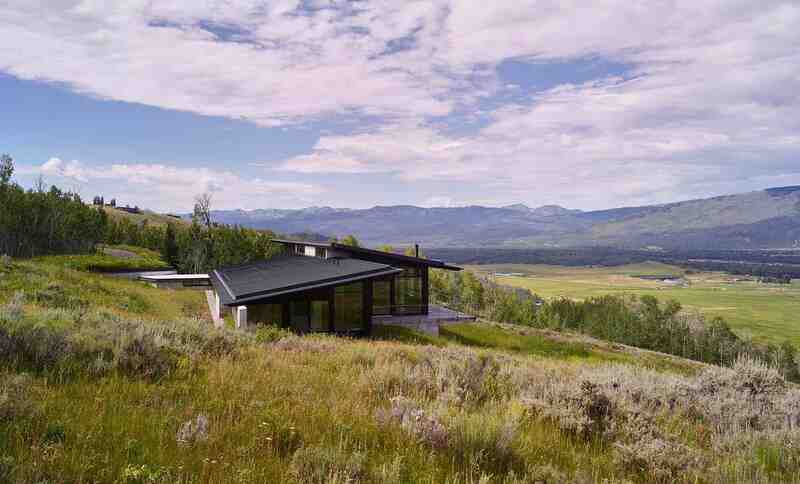 Above: The gently sloping site consists of 12-acres, with picturesque views of the Teton Mountain Range.